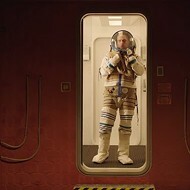 Directed by Michael Dudok de Wit. 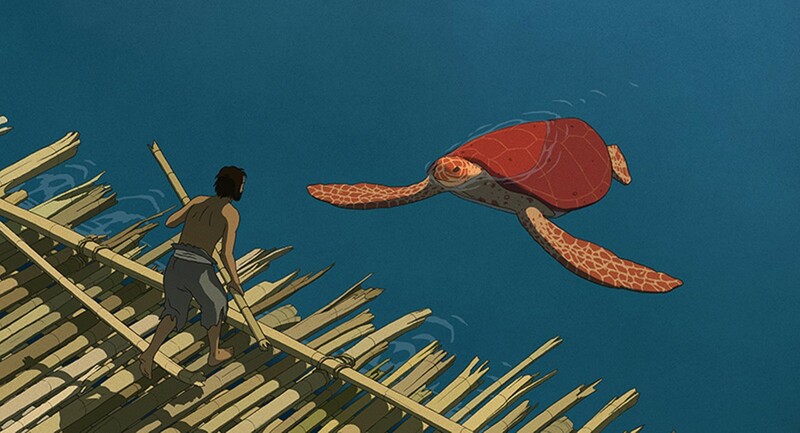 Written by Pascale Ferran and Michael Dudok de Wit. 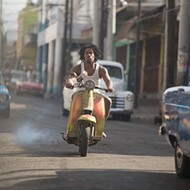 Opens Friday, September 24, at the Landmark Tivoli Theatre and Plaza Frontenac Cinema. 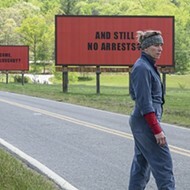 Animated features were once a rarity but have now become commonplace, and while there is apparently no end to the flood of heavily marketed cars, minions, trolls and smurfs, I suspect that the form itself, no matter how commercially exploitable, still carries a trace of the original impulse behind the first animated films more than 100 years ago. Animation is the art of bringing a man-made creation to life. It is both an example of craftsmanship and a kind of magic trick. The animator is both artisan and wizard, a cinematic equal of Pinocchio's Geppetto. Ideally, that work remains personal enough that we recognize the artist's hand, even as we succumb to the illusion of the world that's been created. (Think of Winsor McCay's 1914 classic "Gertie the Dinosaur," where the artist presents himself at work on the thousands of drawings used to make his film, but playfully reacts to the finished product, his animated brontosaurus, as if she were real.) The animator offers an imitation of life, a landscape of ink and paint that can follow the real world as closely as a shadow. 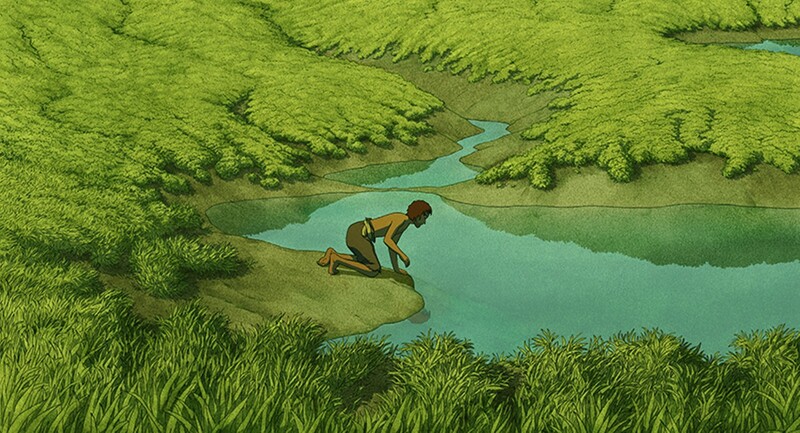 The current masters of animation's unique capacity for weaving the fantastic and the real are the artists of Japan's much loved Studio Ghibli, who take as much care in recreating shifting sunlight or the effects of a mild breeze on a field as they do the flying pigs and wolf-gods in their films. 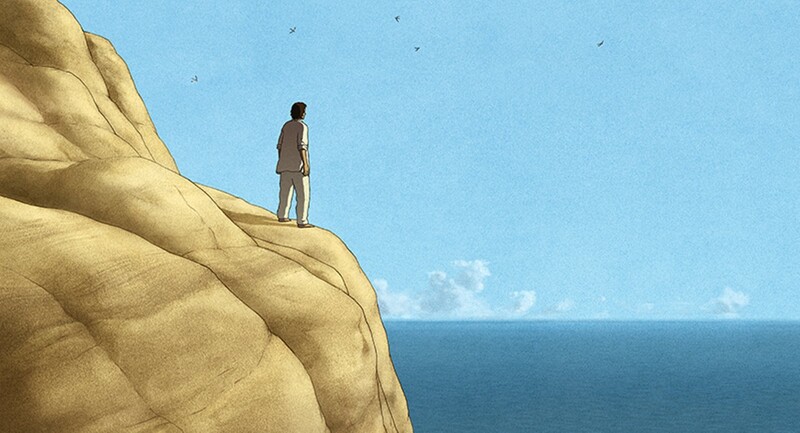 The latest production from Ghibli, though every bit as strange and beautiful as their previous work, is something of an oddity, the company's first film made substantially outside of Japan. Approached by the French company Wild Bunch to co-produce a film, Ghibli founder Hayao Miyazaki showed them the 2000 Academy Award winning short "Father and Daughter" and asked for their help in contacting its maker, Dutch animator/illustrator Michael Dudok de Wit. 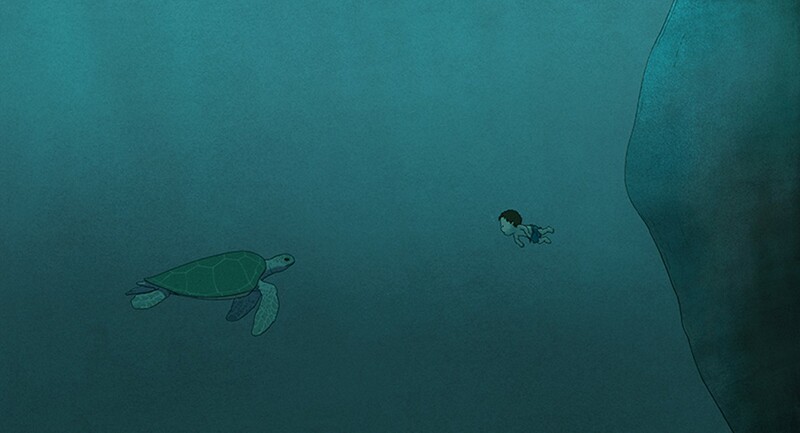 The resulting collaboration, The Red Turtle, is a haunting fable about man, nature and survival, as visually stunning as any Ghibli film but with a uniquely personal point of view. It begins with its hero, an unnamed man, struggling to survive in a raging ocean, though we never learn exactly how he got there. (There is no dialogue, aside from an occasional gasp or sigh.) Washed onto a deserted island, he makes several attempts to build a raft and escape, only to be forced back by a giant, seemingly hostile, red turtle. 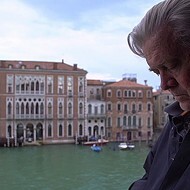 After the protagonist dismisses his large reptilian nemesis, the film resumes its original theme, the story of the man's battle against nature, but with a few supernatural elements always lurking beneath the surface. Any additional plot details would only be confusing — and even a little misleading. 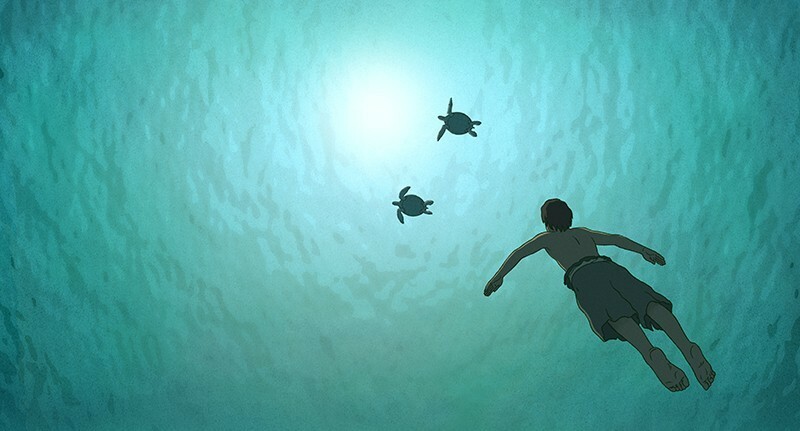 As a narrative, The Red Turtle is short and simple. There are few characters, and despite the absence of conversation, Dudok de Wit makes their intentions and emotions clear. But there is a larger presence in every scene: nature itself. It's depicted in vivid drawings that give the island an almost photographic quality — from the bamboo forest and the ocean depths, which are presented in a kind of hard-lined cartoon realism, to the more painterly landscapes and skylines. It's so easy to get wrapped up in the detail and the everyday struggles of the characters (looking for shelter, exploring unknown terrain), even the more fantastic elements recede in the background. With simple yet expressive human figures and a vibrant, living environment, Dudok de Wit creates a natural world and carefully goes over it with an artist's fine touch. 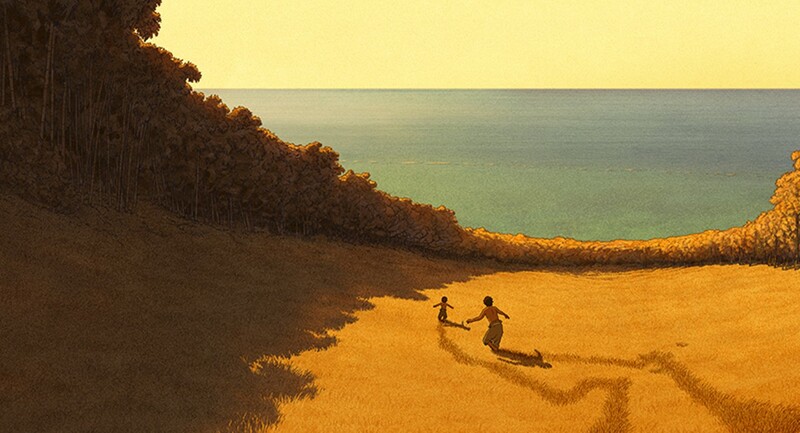 The Red Turtle offers the kind of half-fantastic, half-real atmosphere that can only be produced by animation at its most inspired.